Modern dishes intended for home television use are generally 43 cm (18 in) to 80 cm (31 in) in diameter, and are fixed in one position, for Ku-band reception from one orbital position. 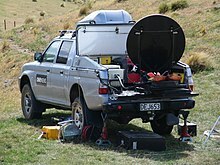 Prior to the existence of direct broadcast satellite services, home users would generally have a motorised C-band dish of up to 3 m in diameter for reception of channels from different satellites. Overly small dishes can still cause problems, however, including rain fade and interference from adjacent satellites. In Europe, the frequencies used by DBS services are 10.7–12.75 GHz on two polarisations H (Horizontal) and V (Vertical). This range is divided into a "low band" with 10.7–11.7 GHz, and a "high band" with 11.7–12.75 GHz. This results in two frequency bands, each with a bandwidth of about 1 GHz, each with two possible polarizations. In the LNB they become down converted to 950–2150 MHz, which is the frequency range allocated for the satellite service on the coaxial cable between LNBF and receiver. Lower frequencies are allocated to cable and terrestrial TV, FM radio, etc. Only one of these frequency bands fits on the coaxial cable, so each of these bands needs a separate cable from the LNBF to a switching matrix or the receiver needs to select one of the 4 possibilities at a time. In a single receiver residential installation there is a single coaxial cable running from the receiver set-top box in the building to the LNB on the dish. The DC electric power for the LNB is provided through the same coaxial cable conductors that carry the signal to the receiver. In addition, control signals are also transmitted from the receiver to the LNB through the cable. The receiver uses different power supply voltages (13 / 18 V) to select antenna polarization, and pilot tones (22 kHz) to instruct the LNB to select one of the two frequency bands. In larger installations each band and polarization is given its own cable, so there are 4 cables from the LNB to a switching matrix, which allows the connection of multiple receivers in a star topology using the same signalling method as in a single receiver installation. A satellite finder may aid in aiming. A dish that is mounted on a pole and driven by a stepper motor or a servo can be controlled and rotated to face any satellite position in the sky. Motor-driven dishes are popular with enthusiasts. There are three competing standards: DiSEqC, USALS, and 36 V positioners. Many receivers support all of these standards. Geometry of offset parabolic antenna. The dish is an asymmetric segment of a paraboloid; the vertex of the paraboloid is below the bottom edge of the dish. The beam axis, which is aimed at the satellite, passes through the vertex and the focus, so the feed antenna at the focus is outside the beam. General Electric satellite dish for DirecTV satellite television. Satellite dishes installed on an apartment complex. The back side of an old C-band satellite dish showing the pole, mount, motor, and structure of the dish. WWE HD trucks in a parking lot. Any metal surface which concentrates a significant fraction of the reflected microwaves at a focus can be used as a dish antenna, at a lower gain. This has led to trash can lids, woks, and other items being used as "dishes". Only modern low noise LNBs and the higher transmission power of DTH satellites allows a usable signal to be received from such inefficient DIY antennas. Parabolic antennas referred to as "dish" antennas had been in use long before satellite television. The term "satellite dish" was coined in 1978 during the beginning of the satellite television industry, and came to refer to dish antennas that send and/or receive signals from communications satellites. Taylor Howard of San Andreas, California adapted an ex-military dish in 1976 and became the first person to receive satellite television signals using it. The first satellite television dishes were built to receive signals on the C-band analog, and were very large. The front cover of the 1979 Neiman-Marcus Christmas catalog featured the first home satellite TV stations on sale. The dishes were nearly 20 feet (6.1 m) in diameter. The satellite dishes of the early 1980s were 10 to 16 feet (3.0 to 4.9 m) in diameter and made of fiberglass with an embedded layer of wire mesh or aluminum foil, or solid aluminum or steel. Satellite dishes made of wire mesh first came out in the early 1980s, and were at first 10 feet (3.0 m) in diameter. As the front-end technology improved and the noise figure of the LNBs fell, the size shrank to 8 feet (2.4 m) a few years later, and continued to get smaller reducing to 6 feet (1.8 m) feet by the late 1980s and 4 feet (1.2 m) by the early 1990s. Larger dishes continued to be used, however. In December 1988 Luxembourg's Astra 1A satellite began transmitting analog television signals on the Ku band for the European market. This allowed small dishes (90 cm) to be used reliably for the first time. In the early 1990s, four large American cable companies founded PrimeStar, a direct broadcasting company using medium power satellites. The relatively strong Ku band transmissions allowed the use of dishes as small as 90 cm for the first time. On 4 March 1996 EchoStar introduced Digital Sky Highway (Dish Network). This was the first widely used direct-broadcast satellite television system and allowed dishes as small as 20 inches to be used. This great decrease of dish size also allowed satellite dishes to be installed on vehicles. Dishes this size are still in use today. Television stations, however, still prefer to transmit their signals on the C-band analog with large dishes due to the fact that C-band signals are less prone to rain fade than Ku band signals. ^ "Team develops in-car satellite TV". University of Waterloo. 2006-05-06. Retrieved 2008-04-29. ^ "News 24 STILL gets an F for physics". Retrieved 2008-04-29. ^ Nye, Doug (14 January 1990). "SATELLITE DISHES SURVIVE GREAT SCRAMBLE OF 1980S". Deseret News. Salt Lake City: Deseret News. Retrieved 30 June 2014. ^ Brooks, Andree (10 October 1993). "Old satellite dish restrictions under fire New laws urged for smaller models". The Baltimore Sun. Baltimore, MD: The Baltimore Sun. Retrieved 1 July 2014. ^ a b Somerfield, Harry (30 September 1990). "Satellite dishes getting smaller, sharper in future". The Tuscaloosa News. Tuscaloosa, Alabama. Retrieved 7 August 2014. ^ a b Barber, Dave (18 August 1995). "500,000 families already made PRIMESTAR their choice in satellite TV". Bangor Daily News. Bangor, Maine. Retrieved 7 August 2014. ^ Grant, August E. Communication Technology Update (10th ed.). Taylor & Francis. p. 87. ISBN 978-0-240-81475-9. ^ Evangelista, Benny (10 November 2003). "Satellite TV in the car, on the move / New technology makes dish receivers small enough to fit atop an SUV". San Francisco Chronicle. San Francisco. Retrieved 7 August 2014. Wikimedia Commons has media related to Satellite dishes (residential). European Commission: The right to use a satellite dish. DishPointer – Satellite dish alignment with Google Maps.